Over the last three years we have established a large panel of functionally active antigen-specific T cell clones with helper T cell characteristics (1–3). Such T cells are reasonably stable and have been propagated in vitro in TCGF-supplemented medium for up to two years. Their extensive characterization in vitro and in vivo has shown that the same cell can express multiple functions and has revealed a remarkable functional heterogeneity among individual clones (4,5). Since long-term propagation of these TCGF-dependent clones is demanding and involves an expensive and time-consuming cell culture technology (4,6), it was obvious to aim at a more convenient source of monoclonal T cells with comparable functional properties. 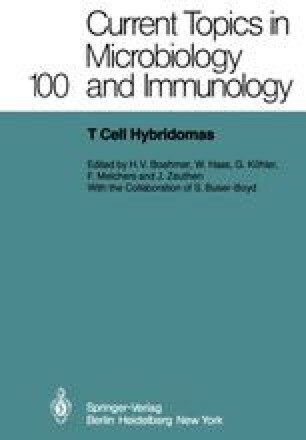 We have therefore established a large panel of T cell hybridomas by fusing the HAT-sensitive thymoma cell line BW5147 with various TCGF-dependent specific helper clones which had been shown to release biologically active factors when interacting with I-A-compatible macrophages and antigen. This allowed us to answer two questions: Are functional properties of TCGF-dependent helper clones expressed in T cell hybridomas? And, is there any correlation between TCGF production and helper activity for the in vitro antibody response?